Spring was his favorite season. It brought color back to his dreary den. Long ago, after a magical sleep, he’d grown too large to leave. 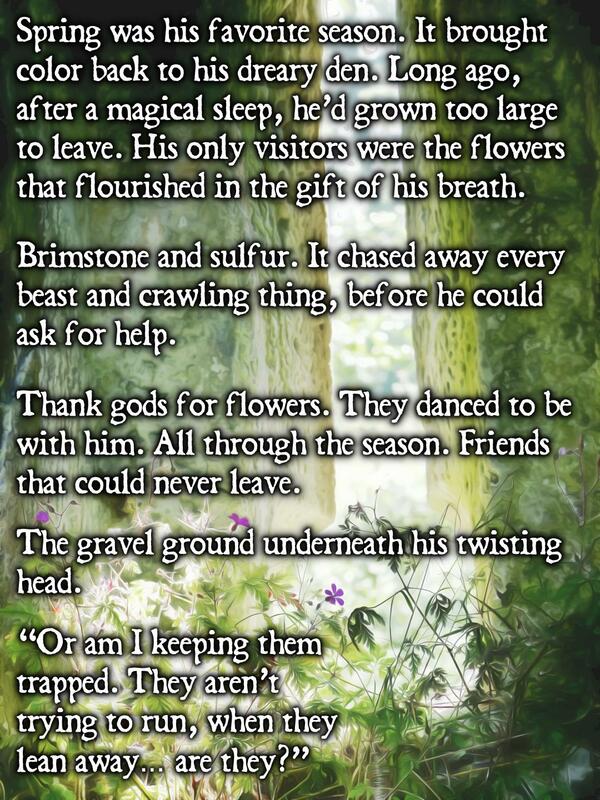 His only visitors were the flowers that flourished in the gift of his breath. Brimstone and sulfur. It chased away every beast and crawling thing, before he could ask for help. Thank gods for flowers. They danced to be with him. All through the season. Friends that could never leave. The gravel ground underneath his twisting head. Thanks os much! Loved this piece of art. It was evocative and open at the same time. Like the cave it made me imagine, where dark but great things might and apparently did lie in wait… Great of course being a relative term lol. I can’t wait to clash again with the talent of the writer space.